Stick square to the puck, hands away from the body and head up. Face the puck and keep the feet moving. Make the first play early on the 2-1. D keep the play to one side so it is a 2-2 with the goalie. 1. F1-F2 leave and regroup with D1. 2. F1-F2 make a second regroup with D2. 3. F1-F2 attack 2-1 vs. D1. 4. F3-F4 leave and regroup with D2. 5. F3-F4 make a second regroup with D3. 6. F3-F4 attack 2-1 vs. D2. *This double regroup organization can be used 1-0, 2-0, 3-0, 1-1, 2-1, 3-1, 2-2, 3-2 or instead of a second regroup dump the puck in and breakout then attack. Create separation by taking quick strides to make the defender cross-over and then cut back in the other direction. 1. Players line up in the high slot and the coach has the pucks. 2. Coach shoot the puck into the corner and an offensive and defensive player go. 3. Attacker drive skate hard toward the back of the net and cut back when the defender chases. 4. Defender is passive but should work on having ‘stick on the puck’ and defensive side. 5. Practice turning up the boards and cutting back low then walk out or wrap around. 7. This drill is good for both offensive and defensive techniques. *Option is for the offensive player to do cutbacks both ways while the defender practices dside and good stick position. After about 5” blow the whistle and play live with the attacker trying to score and the defender to carry the puck above the top of the circles. Keep moving and one touch passes. Give a target, keep the stick square to the pass and hands away from the body. Always follow the shot for a rebound. a. The whole team is involved half at each end. b. Start at the blue line and F1 skate out and get a pass from F2. c. F1 give and go pass to D1 in the corner. d. D1 skate out between the dots and give and go with F1 a second time. e. F1 pass across ice to F3. f. F3 one touch pass to F1 or D1. g. F1-D1 attack 2-0 with a max of one pass before shooting. h. F3 repeat from the other side of the ice. *This drill could be used in a half ice practice or from both ends full ice. *The amount of passes will depend on the skill of the players. Skate on all the edges both front and back and get the feel of the puck passing in defense pair and forward line groups. Add a shot to get the goalies ready. 1. Skate around the ice and loosen up with stretches. 2. Stick twist, toe touch, body rotation. 3. Quad and groin stretch hip rotation. 4. Edges – front and back with outside, inside edges - crossover forward and backward. 5. Forward units and defense pairs pass while skating around the ice. 6. Start passing while skating easy and then speed up. *This hockey specific warm-up activates the body and mind and now the players are ready to practice. Give a target, face the puck, keep the stick square to the pass, hands away from the body, keep skating, pass hard. A. 1 and 2 leave from diagonal blue lines and each take a shot and follow for a rebound. B. 3 exchange one touch passes with 1 then pass to 2. C. 2 pass to 1 who stretches to the far blue line. D. 1 break in and shoot, then screen or rebound. E. 5 from the starting point pass across to 2. F. 2 skate in and shoot. G. 3 and 4 repeat from the other diagonal blue lines. *Options: Do this timing drill for about 3 minutes and then introduce working on Role 3 - ind. defensive skill and roles 2-4 team offense and team defense. After shooting 1 close the gap and play 1-1 vs. 3 and 2 skate out and defend vs 4 while 1-3 battle in front of the net. Make this competitive by setting a time limit to score or playing until the puck is out of play. The defender should skate it out if they get it and pass to 5 who can start the next rep.
Get into the shooting lane first before closing the gap. Create a large surface by going down on one knee sideways and turn the protective equipment toward the puck. 1. Three coaches (or players) spread across the point and have a soft puck or ball. 2. Player starts facing the net at the hash marks. 3. On the signal turn and identify which shooter has the puck. 4. First skate into the shooting lane and then skate out to close the gap. 5. Time it so you drop to one knee sideways just before the shot. 6. Use controlled skating so you can adjust to fake shots or drag and shoot moves. 7. Turn the elbow pad toward the shot and the head sideways to protect yourself when there is no full cage to protect your face. 8. Return to the mid slot and do 3 repetitions. 9. After using this drill to teach technique a good progression is to have a SAG where the Jokers at the point must shoot. Skate into the shooting lane and then either drop to block the shot or pressure the point. 1. Players leave from the dot to block shot in the middle and then the far dot. 2. Skate to get in the shooting lane and then drop to one knee sideways. 3. Stop the high point shot from the top of the circles. 4. Use a ball or soft rubber puck to introduce the technique. 5. Progress to shooter moving sideways and blocker adjusting to stay in the shooting lane. 6. At the other end there are two point men and the defenders leave from the corners. 7. Defender first skate into the shooting lane and then pressure the point. 8. Skate hard to the point and put the stick on the puck. 9. Skate under control so you don't fly past the shooter if he makes a move. 10. First skate out with stick in the D-D passing lane and then on the puck. 11. Progress to mid slot-head on swivel-pass from low to the point and then out. Defenders must skate to keep a tight gap on the attackers. Quick feet, tight turns, the chocktaw turn is the most efficient way to go from front to back quickly without losing speed. F's create 2-1 on a wide defender, defenders keep defensive side, stick on the puck. 1. Players are lined up on both sides in the neutral zone. 2. F1-F2 leave and regroup with D1-D2 who hinge then pass to F1 or F2. 3. F1-F2 skate to the top of the circles, cross and turn back and attack 2-2. 4. D1-D2 skate up to the red line, back to the blue line then up to play the 2-2. 5. Finish the low 2-2 before F3-F4 repeat with D3-D4 the other direction. * This drill can be done from 1-1 to a 3-2 situations. The coach could also vary sending 1 or 2 D or 1-2 or 3 F to cause decision making and communication. * Progress to playing full ice from 1-1 to 3-2 and the attackers must regroup on the whistle and the defenders must close the gap. I just finished uploading about 125 video clips of U17 and U20 teams practicing. There were teams from Canada, Czech Republic and Russia practicing at two arenas. The U20's had a tournament and the U17 had 6 groups and they selected a team that went to the Czech Republic and won the Ivan Hlinka tournament. Almost all of the videos are in the wmv. format and are found in all parts of the video section. Only a few have diagrams so far and have U17, U20, Czech U20 and Russian U20 in the title. You can use the search function at the top right of this page and type in U17 or Czech U20 to access the videos. If you use the advanced function you can narrow the search down to media files. This is a sequence for teaching body checking. The attached PDF has descriptions, diagrams and video links to the drills and games. Challenge the players agility and balance. 1. Players skate in two groups up the middle and back on the wide lane. 2. Running on the toes and doing cross-overs. 3. Pivot from forward to backward with the stick on the ice. 4. The second rep turn the other direction. 5. One skate on top of a puck and stride in and out with the other skate. 6. Switch to the other skate on the puck for the second rep.
7. Skate backwards with one skate on top of a puck. 8. Switch legs the second rep.
Give a target, face the puck, stay on-side, one touch pass, follow the shot for a rebound. 1. A-B, CD leave from diagonal corners. 2. One touch A-K-B and C-I-D.
3. Skate toward the original end. 4. B pass to A and D to C.
*Screen, rebound, pass or defend with the next shooters. Give a target, face the puck, follow the shot for a rebound. 1. Players line up at the four blue lines. 2. A and C start from diagonal corners with a puck. 3. A-G and C-E exchange passes and skate around the middle circle. 4. G pass to C and E to A who skate in and shoot. 5. B and D repeat. * Option is to start with a puck exchange at the blue line then go for the diagonal pass. * Either screen, rebound or give and go, play 1-1 with the next shooter on 1-0 shooting drills. Face the puck, give a target, pass and shoot while skating, follow the shot. 1. A-C leave, skate around the circle and get a pass from G-I. 2. A-C pass to B-D then pivot and skate up the boards. 3. B-D pass to A-C who skates in and shoot. 4. B-D leave and get at passes from F-H.
Face the puck, give a target, skate while you pass and shoot, follow the shot. 1. A-E and C-G exchange pucks from diagonal blue lines. 2. A-C skate toward the diagonal corner. 3. A-G and C-E exchange pucks. 4. A-C skate toward the opposite nets. 5. E pass to A and G pass to C across the ice. 6. A and C attack and shoot. 7. B and D repeat from the opposite diagonal corners. Use big moves and loosen the shoulders. These exercises help develop a player who can handle the puck all around the body. 1. Two lines skate down the middle and back down the sides. 2. Scooter with both skates on the ice and carry the puck making head and shoulder fakes. Hands close together and legs wide apart. 3. Scooter on both skates and carry the puck at the side in the 'Triple Threat Position." Now the player is ready to shoot, pass or carry the puck. 4. Alternate between the backhand and forehand ‘Triple Threat’. Fake hard to one side and quickly pull the puck to the other side. Protect the puck with the body. 5. Carry the puck with the top hand and do big cross-overs on the inside edges. An option that develops shoulder mobility is to skate one way and move the puck the other way. Keep the puck on one side of the blade each direction. 6. Keep the puck only on the forehand side of the blade. 7. Big cross-overs on the outside edges and carry the puck on the backhand side of the blade. Only one side of the blade causes the shoulders to loosen and increases the size of the moves. Links to other examples on how to develop 'Big Moves', separate the movement of the upper and lower body and become a 360 degree player with the puck. Support from the middle and the wing. Create a 2-1 on one of the D. Quick passes and speed are the keys. Defenders switch if the cross is near the blue line and stay man on man if lower. 1. Line upon both sides of the ice in the neutral zone. 2. Start with two red D on one blue line and two Blue D on the other. 3. Two red Forwards leave and regroup with two blue D.
4. The two F’s now regroup with their own red D.
5. Red F’s turn and attack 2-2 vs. the blue D.
6. Play the low 2-2 until a frozen puc, goal or the D skates the puck out. 7. Repeat with 2 blue F regrouping with the original red D.
8. Regroup with two new blue D and attack 2-2 vs. the red D.*This flow can be done 1-1 to a 3-2. *This flow can be done 1-1 to a 3-2. Players must quickly transition from offense to defense to loose puck. Don’t check the Joker who must shoot or pass quickly to the offensive team. Defend from the net side and see the puck and see your man. Attackers protect the puck and get sticks free and gain the offensive side in support. 1. One Joker on the offensive team and a 2 on 2 in each half of the zone. 2. Coach fire in a new puck on a goal, frozen puck or puck out of play. 3. Games can be used to instruct good decisions and technique. 4. Attackers protect the puck and go hard to the net. 5. Defender pass the puck to the coach. 6. Repeat on the other side while new players rotate in. *This game works on all 4 Game Playing Roles and 3 Game Situations. *When the puck is at the point offensive and defensive support are the focus. *Game progression is use one puck and defenders pass to the opposite point to start that side. Make a hard fake to make the goalie lean one way. Shoot where the goalie is coming from and not where he is going. If he goes down then go up, if he stays up then shoot low, if he comes out then deke, if he stays deep in the net shoot. 1. Pucks in the middle circle and players leave from middle gate on the bench. 2. Contest is to see which team scores with all the pucks first. 3. If shooter scores, the next player can’t leave until he touches the bench with his stick. 4. No goal then the rebound is passed to the next player on the bench. *Losing team has to do push ups or skate for each puck they didn’t score with. *Coach can add fun by giving an extra point for the team that scores the most creative goal. Example of a youth team doing the contest with the pucks on the blueline. F1 protect the puck vs. a pinching D. F2 swing below the puck from the middle lane and time it so he is still there when F1 can pass. 1. Two lines of forwards at the blue line and a coach in each corner. 2. Coach rim the puck F1 get to the wall F2 swing below him in the middle. 3. F1 touch pass the puck back to F2. 4. F1-2 do a tight turn over the blue line and attack 2-0. 5. Repeat on the other side with F3-F4. 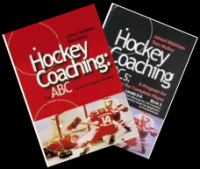 Wally Kozak sent me two PDF's that he prepared on teaching defensive hockey. Wally was my mentor last year and I really enjoyed working with him. He coached the national men's team with Dave King in the 90's and has been involved with HC every since. Wally, like myself, is a long time PE teacher who coaches hockey and looks at the game through different eyes than most coaches. There are a lot of practical ideas in the articles. Wally regularly posts You Tube video that analyzes the game. D get in the habit of looking over one shoulder to read where the pressure is coming from and fake into then skate away from pressure. 1. Coach dumps the puck in from the blueline and one 2 D start at the top of the circle. 2. D skate up to the blueline and then backward pivot to the inside and get the dump in. 3. Two D alternate at each side going back for the puck and pass to the coach. 4. Turn to forward and shoulder check one way to read the pressure. 5. First dump ‘Counter’ by driving to the far post at the back of the net then out original way. 6. Second puck fake to the inside and tight turn outside. 7. Skate between the dots before passing to the coach. 8. Progress to two D leave at once. 9. Start with ‘Over’ D to D behind net then hinge back to D in middle x 2. 10. Next practice the ‘Reverse’ x 2. 11. Players switch to the original side when the skate up to the blue line. 12. Pass puck hard off the boards so it comes back to partner inside the dots. * A progression for this sequence is to have a player forecheck and D read the best option. Shoulder check the inside and then tight turn to the outside. Pick up the puck in the triple threat position and pass up the boards. 1. Player in middle at top of the circles and a coach on each side at the blue line. 2. Skate up to the blue line then backward as the coach places a puck below the dot. 3. Tight turn to the outside and pass up to the coach. 4. Skate to the blue line, poke the coaches stick. 5. Skate backward, turn, shoulder check and pick up the puck and pass to the coach. 6. Skate hard out of the zone. 7. The other players repeat the same sequence. * Always come out of the tight turn with the head up, protect the puck and be ready to pass quickly. Crossing the hands on a forehand tight turn is poor technique. Hold the top hand back and bottom hand low on the shaft and come out of the turn in the triple threat position. 1. Coach passes to the player from the top of the circles. 2. First pass the player does at tight backhand turn and pass to the coach. 3. Second pass turn backhand then skate in and shoot. 4. Rep two turn to the forehand. * Always follow the shot for a rebound. The player who wins the loose puck battle gains a huge advantage and can add players. Maximum or 3-4 players on each team. Add players to the outnumbered team after a scoring chance. Leave room behind the net for walk outs etc..
1. Players line up on the blue line, one team on each side and leave from the middle. 2. Start with the coach shooting the puck in for a 1-1 loose puck battle. 3. Puck carrier can score or add a player with a give and go pass. 4. A 3-1 is the largest advantage. 5. The defender can also give and go if he gets the puck. 6. After a scoring chance the coach adds players to make even situations 2-2 or 3-3. This is a nervous system overload situation where the player must adapt to the weight, bounce, feel, size of different objects and because there are multiple pucks, balls and rings he/she must also develop split vision. 1. Play a game with everyone on the ice at the same time. 2. Have multiple pucks or a combination of pucks, balls and rings. 3. If there is a soccer ball then only the feet can be used. 4. With a ring the player turns the stick upside down. 5. Only one player at a time can shoot, so the goalie must see and react to the shooter. 6. Leave the puck, ball, ring in the net after a goal and count the objects when all are in the net. 7. Use multiple nets if it is a large group with more than two goalies. *The big guy in white and red is Dany Heatley when he was playing for Wisconsin. He came to my camps and trained with summer teams I coached from age 5. Go as fast as you can and make fakes, tight turns and protect the puck vs. coaches. 1. Start from the top of the circles in 3 lines. 2. Skate at full speed in the neutral zone. 3. Avoid other players and poke checks by coaches. 4. Make dekes, tight turns, fakes. 5. Pass to the front of the next line. The purpose of this site is to help coaches make practices more effective and enjoyable for the players so there is no point in having material that no one can find. You can use the search function at the top right hand corner of this site and refine it with the Advanced Search Function. You can also search my dropbox PDF Folder or the Video Folder. The PDF.s have the description, diagram and video link to just over 1000 drills, games, shootouts etc. These are examples. Try any common hockey term. Attack with speed to maintain the 2-1 and defenders must identify who they will cover. 1. Start at one end from the circle. 5. Attacker 1 and 2 race down the ice to score. 6. Play out the 2-2 until the whistle and coach shoot in a new puck if needed. * This video shows the Finnish coach Jalonen running this drill as a shootout contest. This is a video showing the analytic s that compare cross-ice and half-ice to full ice hockey for U8 players. It gives data on the number of touches etc. They have been using cross-ice in Europe forever and Juhani and my book extol the benefits of SAG as well as full ice games with modified rules. When 82% of your clients are quitting by age 14 maybe it is time to try plan B. Make practice more enjoyable, more effective and somewhere players want to be at. Coaches keep designing better and better drills that are slowly becoming more game-like but I ask. What is more game-like than a Game?????. I can't speak French after 3 years of drill and practice with no conversational time. Education went to 'whole learning' in the early 70's. When will NA sport do the same thing? All times are GMT. The time is now 12:59PM.